House dust mites is one of the most common allergen triggering eczema in older children. We often think of house dust mites residing on the bed sheets, pillows and mattresses. One often overlooked area is the child car seat. This team of researchers from Ireland studied the type and amount of allergens in the child car seats and (oops, add one more thing to your to-do chores) it turned out child car seats are quite loaded with dust mites and allergens. Here’s a quick look at the study. Results: 12 species of mites, of which nine are known to produce harmful allergens, were recorded from 212 dust samples. 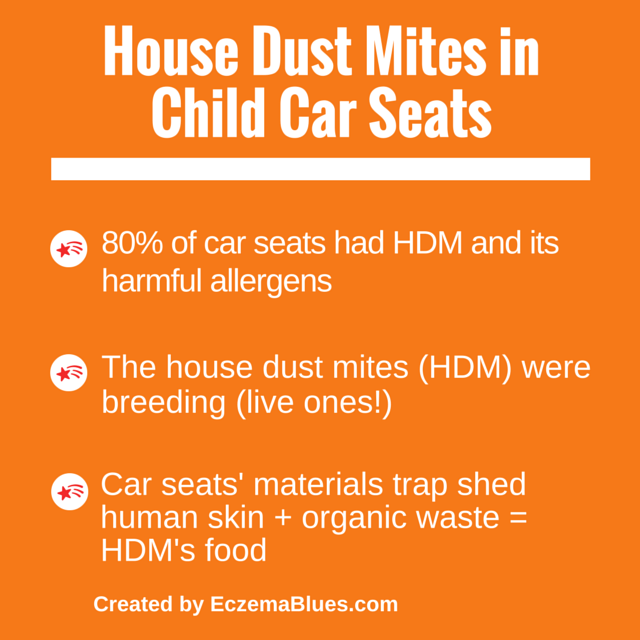 Over 80% of drivers’ seats and over 77% of child car seats had house dust mites and its allergens. Over 12% of driver seats and 15% of child car seats contained house dust mite levels sufficient to be risk factors for sensitization and allergic reactions. From the samples examined, the house dust mites were breeding (not dead). What it means: For those with eczema, asthma and rhinitis, you’d have to add car seats to your list of items to clean. Especially if you spend long hours in the car, even more critical to vacuum your car seats regularly. Plus it is compulsory for your child to be in a child car seat for safety. Why dust mites love car seats: The researchers pointed out that the materials of the car seats, being made of polyester and/or cotton, trap shed human skin and other organic matter (like food) that are the food sources of house dust mites.